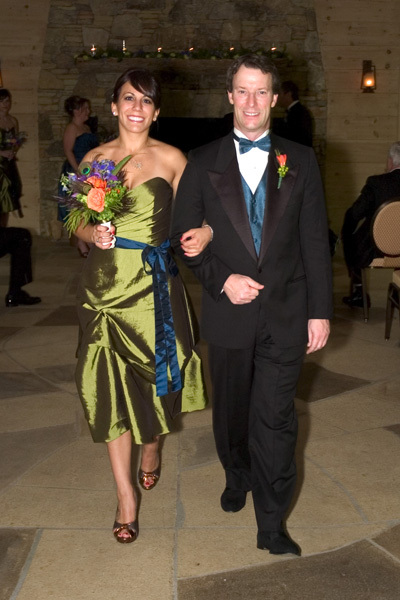 Anna & Pete’s wedding in the spring of 2009 was my first real wedding gig as a floral designer. 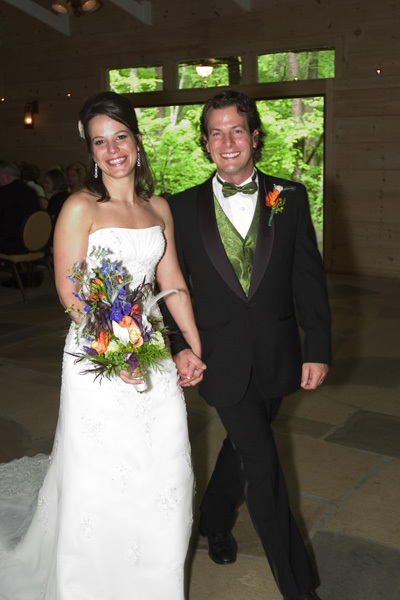 They got married in gorgeous Brasstown Bald at the amazing Brasstown Valley Resort. Anna’s inspiration for her wedding colors was a peacock feather and, as she is extremely creative herself, she used this theme to great effect throughout the weekend. 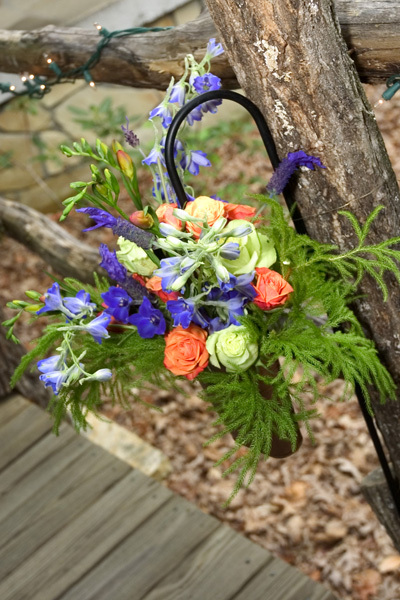 We used flowers throughout the grounds, including in buckets on hooks leading to the wedding. The centerpieces were orchids wired on large antler twigs Anna collected herself, in glass vases grounded by river stones, also collected by the bride. Peackock feathers were interspersed with flowers in the bridesmaids’ bouquets and all the boutonnieres, and Anna’s bouquet contained white peacock feathers. The result was a beautiful a harmonious design that kept interest without becoming overdone. A side note: The original plan was for the wedding to be outside, but rain had other plans, so we relocated to the pavillion. 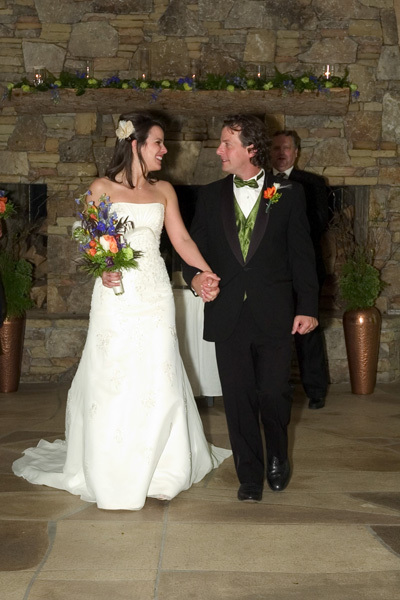 I was there all weekend, and would be remiss if I did not mention here how absolutely helpful and accomodating the staff was at Brasstown Valley Resort. Probably the best I’ve seen. 08 May	This entry was published on May 8, 2009 at 5:30 pm. 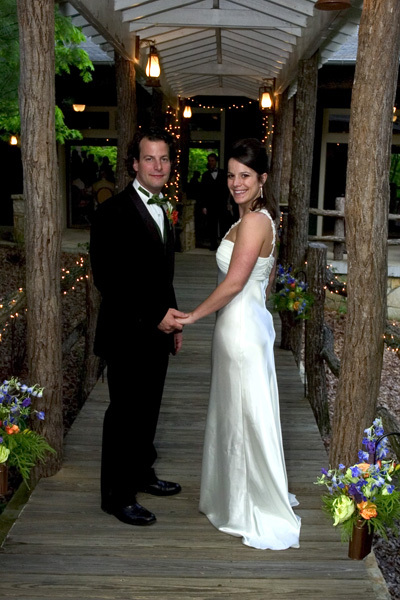 It’s filed under Bouquets, Boutonnieres, Clean, Romantic, Uncategorized, Weddings and tagged brasstown bald, brasstown valley resort, orchids, peacock feathers, spring, wedding. Bookmark the permalink. Follow any comments here with the RSS feed for this post.